We are in an era where watches are being used for more than just an instrument to tell time. Over the past decade, we have seen a radical transition of smart devices, and these smart devices have taken over in every sphere of our lives. Wearable technology is booming in the market nowadays. Wearable devices are devices that can be integrated into clothing or devices that can be worn on the body as accessories. This blog focuses on wearable devices with a round shape. Considering wearable as the most emerging trend in the future, Samsung has introduced the Circular UI to simplify app creation of wearable devices. With this feature, app developers can explore and create many different apps for wearable devices and be on par with the industry. According to research, the circle shape is considerably easier to pursue by human eyes. Our brains are capable of processing information within a circular shape a bit faster than an information inside a rectangle or a square shape. User experience enhances when we use comforting curves instead of sharp edges. 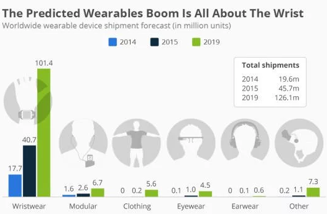 Current wearables typically consist of a touch screen, buttons, or both. Wearables with circular displays use interactive techniques such as swipes and multi-touch inputs. 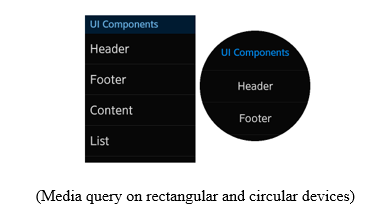 Circular UI is a set of helpful extensions of Xamarin.Forms framework. 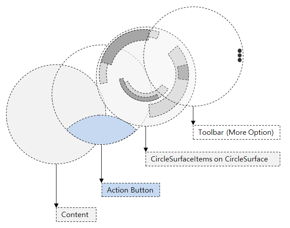 Currently, circular UI works efficiently with Visual Studio 2017. 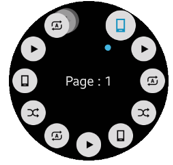 The Tizen Wearable Web UI framework provides rich Tizen Wearable UI Components. You can use the UI Components for CSS animation and rendering purposes. The wearable UI components are designed to allow the user to interact with a small touchscreen-equipped wearable device with rotary component parts. The circle surface component manages and renders multiple circle objects to one single circle surface. This circle acts as candidates of an object to be rendered. The rotary selector component is composed of a selector and multiple items surrounding the selector. 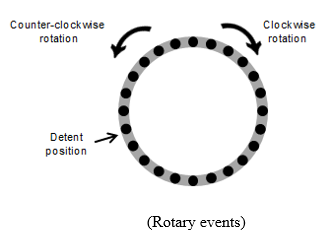 The rotary selector can be used to select an item or to move to the next or previous page through a rotary event. The expandable header offers events to support interactivity with other components. This component shows the progress bar. You can create a circle-shaped progress bar component with the CircleProgressBar API. This control helps to select date or time that fits in the circular screen. This control shows a Circular ProgressBar, Circular Slider, and MenuItems on a circular menu. Wearables will be the “the next big thing,” and wearable app development is what you must go with. With all these components and controls discussed in this blog, you can make an effective circular control. When this circular control is integrated with a rotating bezel, it gives a user-friendly experience.